Sevamritham – Principal Brni. 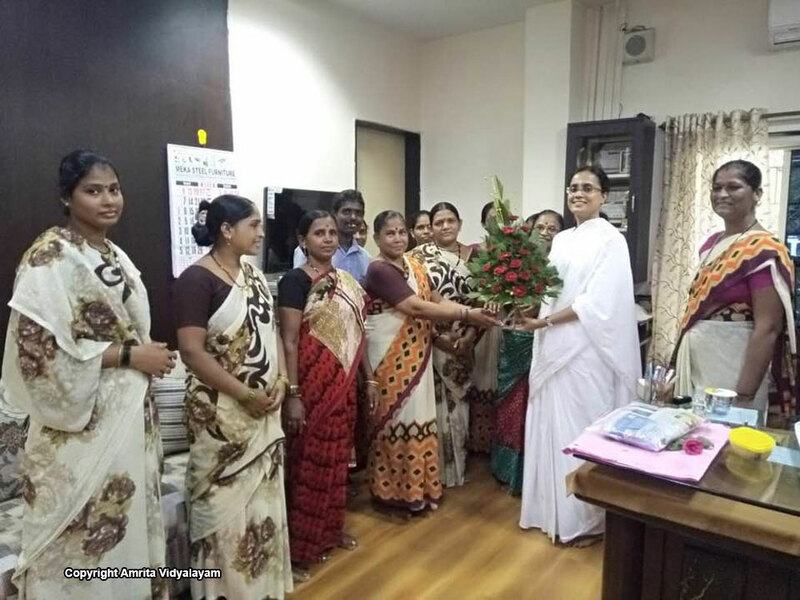 Rekha gave cloth bags to class monitors appointed for the Sevamritam Project to collect the “handful of rice”. These cloth bags were stitched out of old school uniforms by school teachers in order to promote cloth bags and reduce plastic usage. ‘Sealing of Desires’- Every bit counts. Students are now used to the concept of sacrificing some of their desires for this project. The classes that contributed the maximum towards this project were 7A, 4C and 4A. The money will be utilized for buying food and other essential items for the needy. Wealth from Waste – Around 10 cloth bags were stitched by students of Class V.
Bhootayajnam – Students from pre-primary to Std. II brought grains like rice, millet, jawar, etc. to feed birds. As they were tuned to this for the last 2 years, they do not need to be reminded to bring the grains. 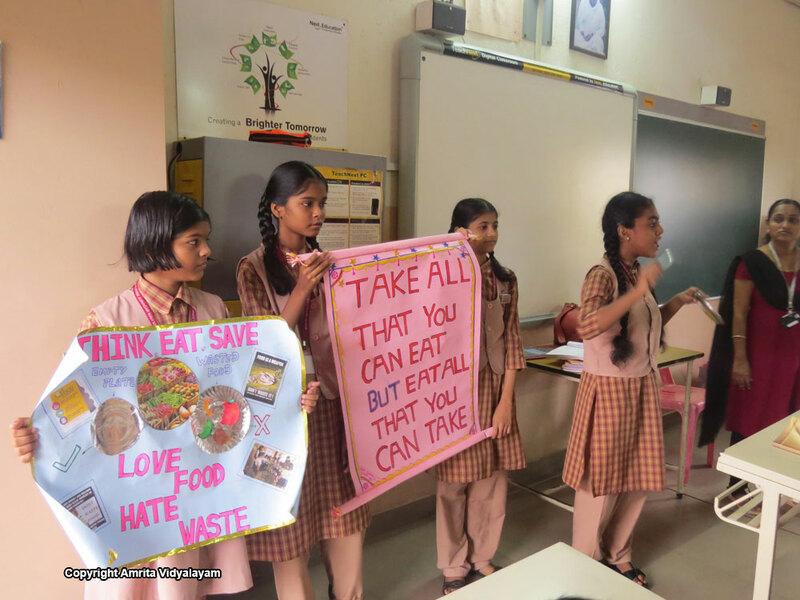 Grihamritam – Students acting as brand ambassadors of “Eliminate Food Waste” went around each classroom to spread the message “Take all that you can eat, but eat all that you take”. 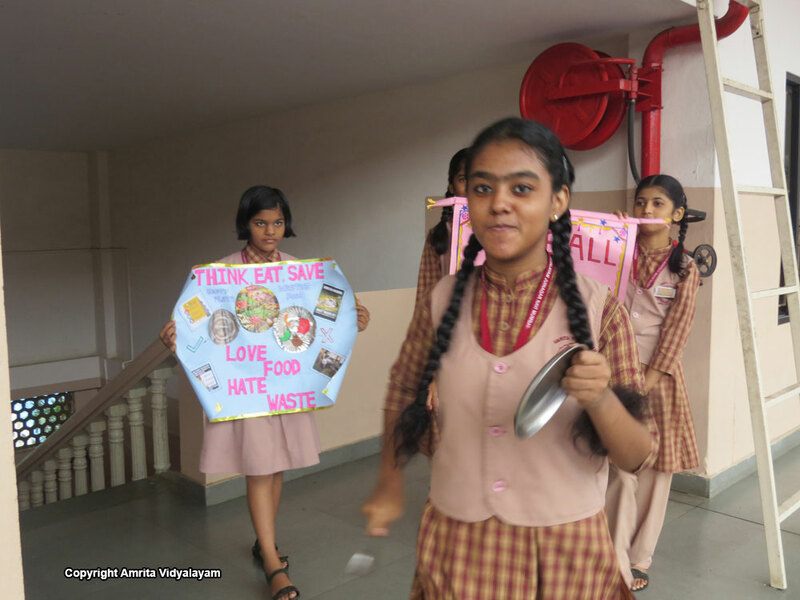 No more dry waste bins in the school meant students will not throw away food. They will eat their snack/lunch fully or take home the leftovers. The message was clear – no more food waste. Use leftovers or compost spoilt food. 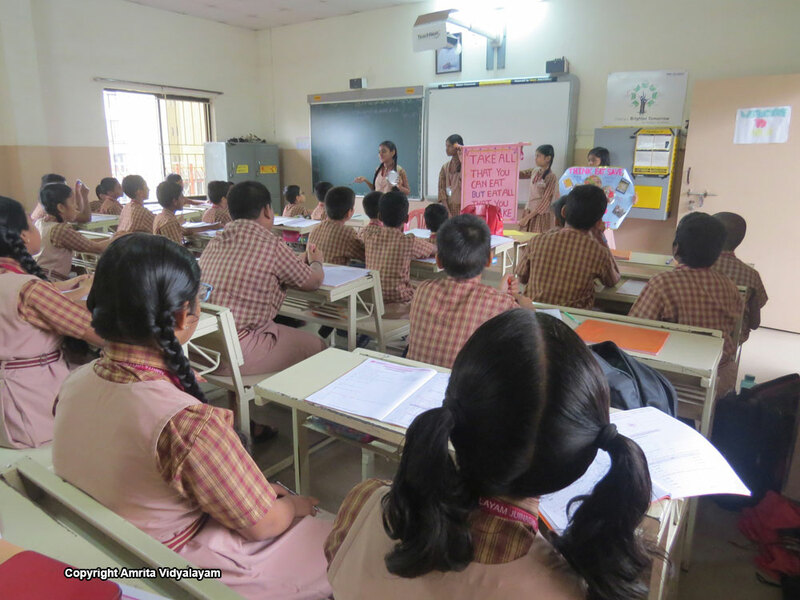 Snehamritham – Birthdays of students, teachers and staff were celebrated by announcing their names during the assembly. 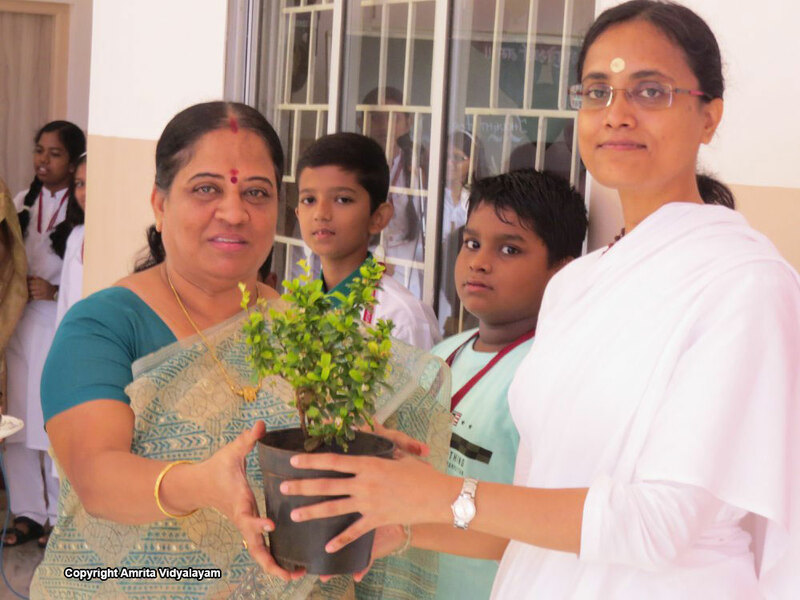 While students were given sweets, teachers were given Amma’s book “Cultivating Strength and Vitality”. Teachers and students celebrated Brni. Rekha’s birthday by gifting her greeting cards and a personalized album. Mathias and drivers were given 5 kg rice by the Principal. Neel Nitin of 5C, Kshitija Khilari of 7A and Mahi Shinde of 7A, each donated 1 kg of rice towards Sevamritam project.